I have the little sibling problem, and anyone with sisters and brothers probably already see where I’m going with this. You are having a great time, curb stomping levels left and right, making light work of bosses, looting so many crates, then a sibling comes in and with that sickeningly sweet voice they ask, “Can I play?” and now you have a dilemma. You want to keep up with your savage flow, but you know that you’ll have a nagging gremlin at your shoulder if you turn them away. So, how about a game that lets you get the satisfaction of game play and appeases your sibling? If you need that in your life, try Hyrule Warriors for the Wii U. Now, for those who don’t know, Hyrule Warriors is part of the Dynasty Warriors and Team Ninja (think Dead or Alive) family that mixes the wartime, ‘capture the keep’ type strategy with Legend of Zelda lore. It, of course, is just a spin-off series that has no place in the official timeline, but it does tell a good story that scratches all your Zelda itches. Bosses like King Dodango and The Imprisoned (aptly named “Potato Toes ” by my sister) are showcased and are a throwback to their original games all the way down to how you fight them. This game is completely hack-and-slash with a never ending spawn of mobs (or Moblins for that matter) to go after. This is perfect for sibling co-ops. Just give them the Wiimote and let them take down some of the crowds while you finish the smashing of bosses’ faces. You see, through out the stage, as per all “Warriors” games, you have mini missions that you can complete in order to win the battle in that level. These can range from protecting an important character, to capturing garrisons, to calling upon our ever-so-(ahem) beautiful, Great Fairy to assist your cause. When you begin to play, you’ll learn where it’s best to let your sib roam free to kill the masses and destroy ALL THE POTS. And with the separate screens (you using the Gamepad and them using the t.v), you can get things done pretty efficiently. Though all this is great, I will say to make sure to keep your mini-player 2’s health high, if they are KO’d, that is the end of the run and you have to start again from your last checkpoint. Not too bad, but I’d rather keep them out of the way and finish in one sweep. 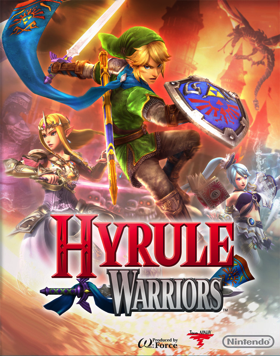 So if you need a game that is pipsqueak friendly that still allows for some decent game-play with some nostalgic value, I’d definitely go with Hyrule Warriors. Live long and game longer Readers.